Want to enjoy smoothies more easily and with less mess? Build a smoothie station to streamline your process and to help you enjoy more smoothies more often. Don’t you just love a good smoothie? Cool and creamy, sweet and tart, packed with all kinds of good things. Spinach? check. Kale? why not? Chia seeds? sure. Smoothies, particularly those with a stealthy dose of greens and nutritional supplements, can serve as a great breakfast, lunch, snack, or even dessert. And yes, I know plenty a mom who’s served her family smoothies and popcorn on a Sunday night when she’s just done with cooking. They’re expensive to buy at the fancy pants shop. There’s a fair amount of stuff to haul out when making them at home. Either option can seem a little too much sometimes. That’s when it’s too your advantage to build a smoothie station. What is a Smoothie Station? 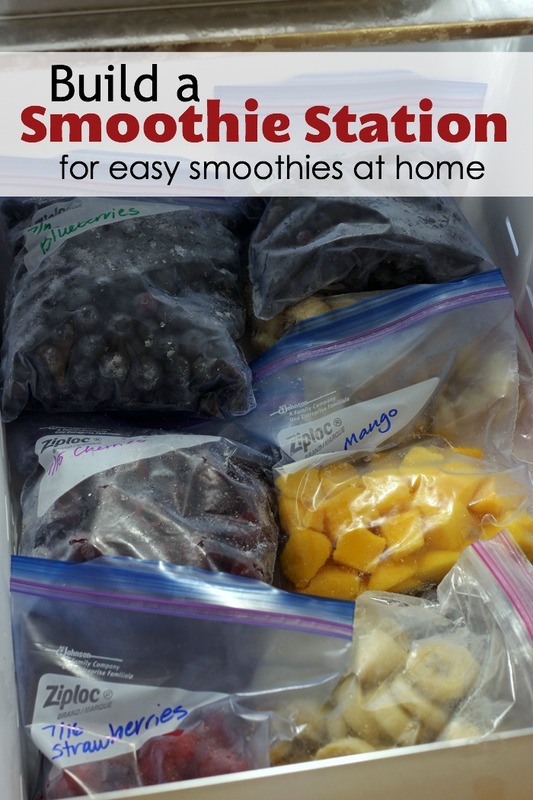 A Smoothie Station is a centralized location in your freezer to store the ingredients for making smoothies. Pretty simple, right? Why build a Smoothie Station? If you make something easy to do, you’ll do it more often — and likely better. By building a Smoothie Station you make it easier to make smoothies. You also make it easier for others in the household to make their own smoothies. “I love hearing, ‘Where’s the XYZ?’,” said no one. Ever. Make it easy on yourself as well as those you live with. 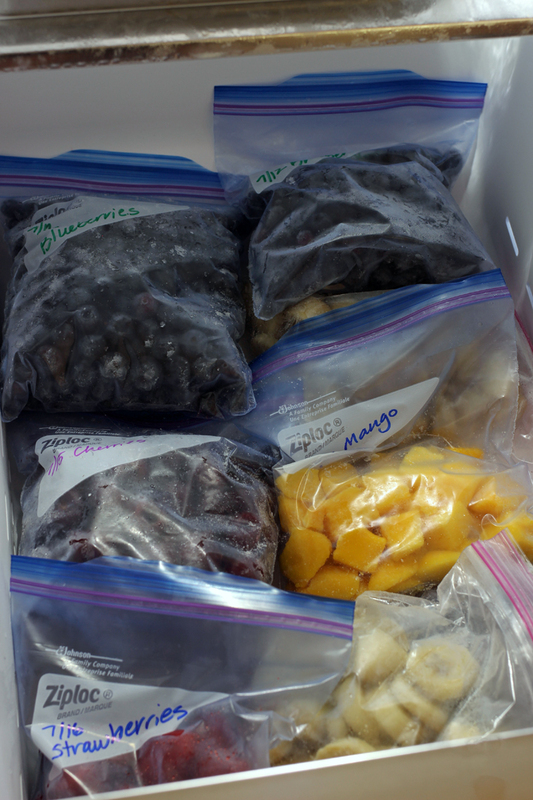 Create a dedicated drawer or shelf in your freezer to hold smoothie supplies. What should you put in your smoothie station? I typically chop and “flash freeze”, though really, it’s called open freeze, any fruit that we have that is getting very ripe or those that I find a great deal on. I also freeze little lumps of plain Greek yogurt when I find a great sale. Yogurt acts as a great thickener, especially when frozen. You can make your own frozen yogurt lumps in ice cube trays, but it’s easier and less messy just to dollop your yogurt onto a piece of plastic wrap on a tray. Slide it into the freezer. Once the yogurt is frozen, it pops right off the plastic wrap and you can store all your little yogurt lumps in a freezer bag in the freezer. This is a great use for yogurt you find on sale, but also a nice way to use up yogurt that might be too close to the “best by” date. Making smoothies at home is a great way to save money as well as enjoy smoothies that are truly custom-made, right down to how the berries were sourced. 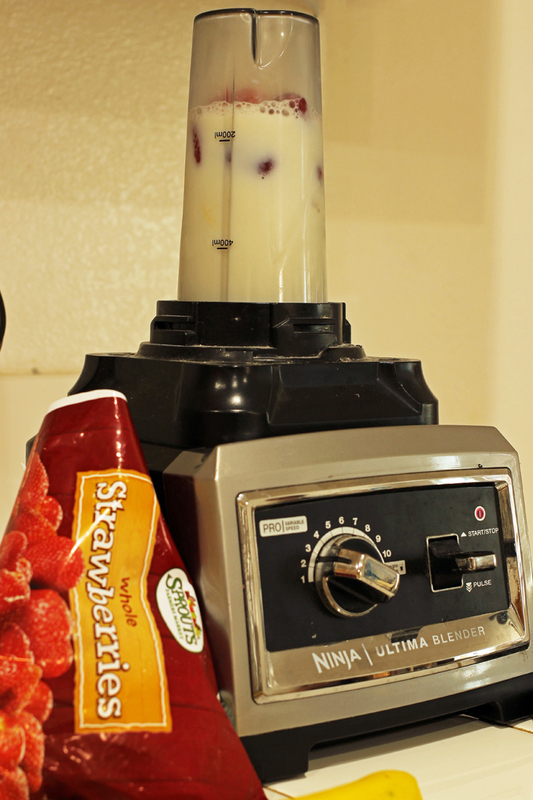 Make it easier on yourself by building a smoothie station at home. I prefer fresh smoothies so this smoothie station setup works well for us too. I keep flax meal in my station. I don’t chop bananas, I peel and break in half and freeze that way. Loose leaf spinach from the freezer section is a big hit for “Hulk” green smoothies and everyone loves them. Pineapple, coconut, and mango are also big hits in our house. We keep our protein, shaker bottles, and blender all in the same cabinet for ease of use. I love the idea of adding in sorbet. Yum!! @Allie Zirkle, what form of coconut are you using? Our smoothies are much like yours, including the tropical fruits. I make a green smoothie every morning with 1 banana, 1.5 cups spinach, 1 T flax, 1 cup milk (kefir/almond combo) and then an additional fruit. Those you have mentioned are also fantastic with 1 T of chopped fresh ginger! My husband loves fresh coconut – bought whole, he stabs, drains and peels the skin. It’s quite a process, but he enjoys it and finds it relaxing… kinda like peeling garlic, lol. @Tiffany @ DontWastetheCrumbs, Oh ginger sounds refreshing!! Maybe I’ll try that for a lunch smoothie. I love the yogurt dollop idea. Thank you!! I like to buy the larger plain yogurt containers, but we don’t usually go through it all fast enough. I’ve started buying individual containers because of this, so you have just saved me money. Not sure why I never thought of this. I love the frozen yogurt dollop idea. I am going to try it tomorrow! My 14yo will be so excited. I freeze my bananas for bread but didn’t think to freeze them for the smoothies–duh. And I definitely didn’t think to do the yogurt thing. Brilliant, especially with the healthier yogurt that doesn’t ever seem to get used up as fast like the sugary stuff. And the more frozen stuff the better for smoothies! Know what to add to my list for next week! How much greek yogurt does he use in a smoothie–I haven’t used it too much so it would be a nice to have a starting point. Freezing the greek yogurt is GENIUS! What a great idea! Stupid question here…do you have to thaw the fruits/yogurt first or can you just throw it into the blender frozen? @Allyson, not stupid. Since you chop/make them smaller, they should blend well if there’s enough milk or juice. You can also let the mixture set for a few minutes before blending. It really depends on your blender and the texture that you like your smoothies. Adding crushed ice is something else we do. To reiterate some other comments – genius on freezing yogurt! I wanted to mention that adding frozen anything (fruit or yogurt) will make your smoothie thicker and obviously, cold. I think it has to do with the water content of the fruit being frozen, so it’s kinda like adding the fruit plus miniscule ice cubes to the smoothie… but that’s my non-scientific answer, lol. Still just as nutritious and delicious! I make a smoothie every day to take to work. I do 1 cup frozen fruit (mango, pineapple, strawberries) to 1 cup greek yogurt and a little milk. 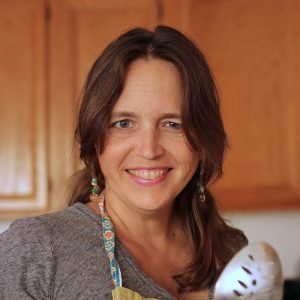 I use my immersion blender so it’s quick and easy, and very little clean up. Then I pour it into my “to go” smoothie cup and pop it in the freezer while I finish drying my hair, etc. I pull it out 5-10 minutes later and it’s perfect for the drive to work! This is a great idea! Such a good way to use up that food that is *almost* on its way out. What type of protein powder do you use??? I blindly go some at the store – added it to our smoothies and the kids hated it!!! Too gritty and chalky!! What are some favorites?? @Angela Lierman, it was hard to choose. We’re avoiding unfermented soy and a few other junky items. So, we landed on the store brand at Sprouts. No soy. This is probably a stupid question, but what kind of liquid do you usually use with your frozen ingredients? Do you always use juice or does water sometimes work? Do you ever use soy milk? We use juice or milk, usually. 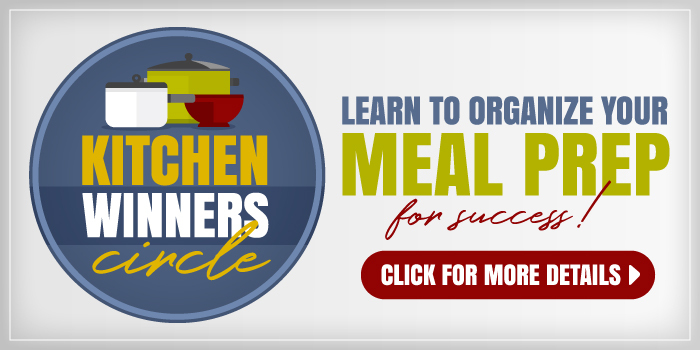 What type of blender do you have? I need to purchase one that could handle smoothie making and need some recommendations. @Karen, we have a Magic Bullet. I’m thinking of one of the power blenders though. Wondering if they really are wonderful. 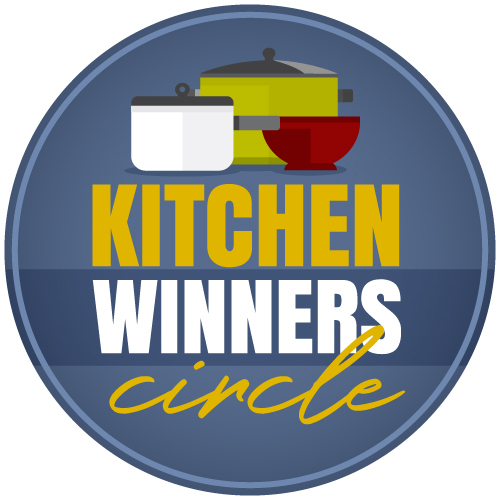 A vitamix is WELL worth the investment! My grandmother bought one about 10 years ago and passed it on to me…I use it daily and it is still going strong! Love the yogurt and banana ideas!! Gonna try that! We keep frozen fruit on hand for smoothies! We have a hard time keeping bananas around long enough for smoothies, but maybe if I get them in the freezer before little hands can eat them!! Where do you find ice milk. I have not seen it in years.